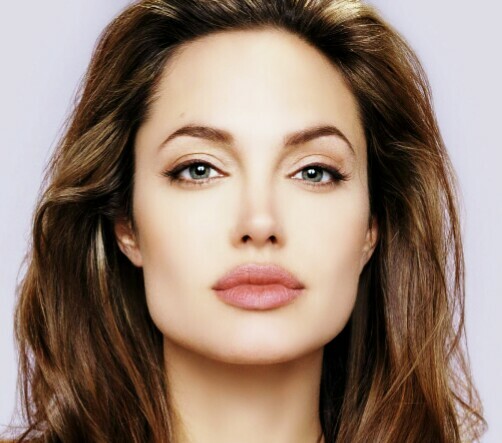 Juicy Facts About Angelina Jolie! ~ CK Jacob: Nigerian Fiction And Lifestyle Blog. 1. Angelina Jolie Voight was born on June 4, 1975, in Los Angeles, California, to actor Jon Voight and actress Marcheline Bertrand. 2. Her blood is composed of five non American blood ancestry and with American blood traced from the Indigenous people, Iroquois from North America. She has blood traces from France, Germany, Slovakia, Netherlands and Canada. 3. In a bid to keep her daughter from going out partying and potentially turning to drugs, her mother allowed 14-year-old Angelina to live with her boyfriend in Angelina’s bedroom with Marcheline sleeping in the room next door. 4. After two years of enrolment, Angelina dropped out of her acting class from Lee Strasberg Theatre Institute to pursue her desire of becoming an undertaker or a funeral director. She went on to study embalming. 5. Her natural hair color is dark blonde. Her mother dyed it dark brown when she was four or five and she’s kept it dark ever since. 6. Angelina had an obsessive crush is “Dr. Spock”. Doctor Spock is a fictional character from the TV program Star Treck that became famous during the 1970’s, the era when Angelina was on her youth. 7. Probably one of her first tattoos, Jolie’s tattoo on her left arm was done in her mother’s presence. The tattooed words are “A prayer for the wild at heart kept in cages” ad was inspired by the words of Tennessee Williams. 8. 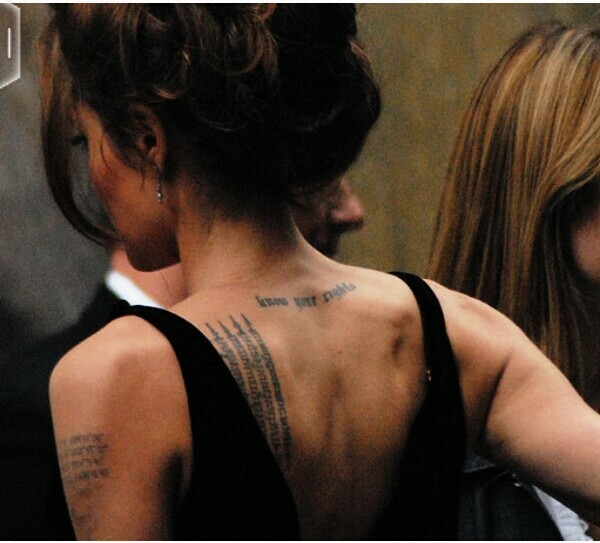 Angelina has a tattoo between her shoulder blades that says “Know Your Rights”. This phrase tattooed is a title of a song from her favorite band, The Clash. 9. The tattoo on her left shoulder blade was performed by a Thai artist using a hammer and "a foot-and-a-half long needle," she told People. 10. In total, she has fourteen known tattoos. She has a Latin proverb "quod me nutrit me destruit" (what nourishes me destroys me), two sak yant designs featuring a prayer of protection and a twelve-inch-by-eight-inch tiger, and seven sets of geographical coordinates indicating the birthplaces of her children and her partner Brad Pitt. 11. Angelina keeps her famous lips healthy with Blistex brand lip balm. 12. Jolie is one of the highest paid Hollywood actresses. She was ranked on top of the Hollywood’s most paid actresses during the years 2009 and 2011. 14. She loves doing her own stunts. As Lara Croft, Angelina Jolie performed almost 80 percent of the stunts. 15. She has been married twice. She married Hackers co-star Jonny Lee Miller in 1995. She wore black leather pants and a white top with Jonny's name scribbled in her own blood to the ceremony. The couple divorced in 1999. 16. During the split from Miller, before their divorce was final, she had her first openly gay relationship. She began dating her 'Foxfire' costar, Jenny Shimizu, in 1998. 17. The following year, Jolie married Academy Award-winning actor Billy Bob Thornton. The couple got married in Las Vegas and the ceremony cost $189. That union lasted until 2003. 18. In 2001, Angelina Jolie and Billy Bob Thornton signed their wills in blood. 19. Jolie met her next romantic partner, actor Brad Pitt, during the making of Mr. and Mrs. Smith in 2004. 20. 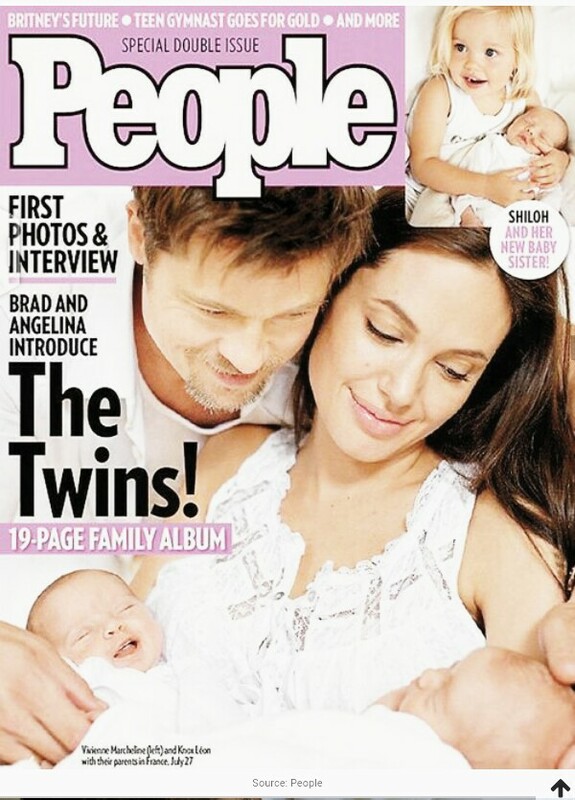 Angelina and Brad have 3 biological children together. The first daughter, Shiloh, was born in Namibia as the couple sought to avoid the media frenzy surrounding the birth. 21. Jolie gave birth to twins, Knox Leon and Vivienne Marcheline, on July 12, 2008, in a seaside hospital in southern France. 22. The couple sold the rights for the first images of their twins to People and Hello! magazines for $14 million—making them the most expensive celebrity pictures ever taken. The money went to the Jolie-Pitt Foundation. 24. Angelina recently ask for a divorce. Brad Pitt and her are seperated.